Ah’¦ Desserts. It is one of the most common indulgences of a food lover. Perhaps the most popular kind of dessert is a frozen dessert. The combination of sweetness and cold is truly sensational. It is exactly what you wanted after a sumptuous meal. Many would even consume frozen desserts as snacks and to some, it can be quite addictive. Generally, a frozen dessert is defined as any type of dessert made by freezing a mixture of liquids, semi-solids, and sometimes even solids. Frozen desserts are categorized into many different types. The most popular frozen dessert of all is the Ice Cream. Everybody loves Ice cream. I do not know a single person who doesn’t like Ice Cream except if an individual is on a diet. It should be noted however that not just any frozen dessert can be considered as Ice Cream. There are definite criteria that a certain frozen treat should follow — in terms of ingredients and processing — in order to technically qualify as an Ice Cream. The US Department of Agriculture had made standards and it clearly states that an Ice Cream should contain no less than 10 percent milk fat and 6 percent non-fat milk solids. That standard has unambiguously categorized frozen desserts as Ice Cream or something else. Ice creams can increase in the amount of milk fat it may use. Manufacturers can even go up to 16 percent milk fat but ice creams with that amount of milk fat are more expensive because it is richer in flavor and creamier in texture. Ice cream is classified in the amount of milk fat it has. There are regular and premium ice creams where the premium ones have the higher amount of milk fat in their ingredient. Conversely, frozen treats can be many of different types made with various ingredients, these are sorbets, low-fat ice cream, frozen yogurt, and frozen custard. The ingredients of an ice cream may be simple enough — milk fat, non-fat milk solids, sugar/flavoring, and air ‘“ but the process of making it is complex. The process of making ice cream aims to emulsify ingredients together and make the mixture foamy. It is often a delicate process that other manufacturers even have their own procedural secrets. In comparison to other frozen desserts, ice creams are much more complicated to manufacture. 1. Ice creams contain at least 10 percent milk fat and 6 percent non-fat milk solids. Anything less than those are considered to be different frozen desserts. 2. 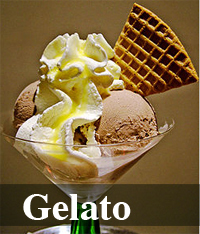 Ice creams are creamier and richer in flavor as compared to other frozen desserts. 3. Ice creams are much more complicated to make. Frozen desserts are easier and often faster. 4. Ice creams are further categorized based on the amount of milk fat it has while frozen desserts can be a lot of things. Ian. "Difference Between Ice Cream and Frozen Dessert." DifferenceBetween.net. December 2, 2009 < http://www.differencebetween.net/object/comparisons-of-food-items/difference-between-ice-cream-and-frozen-dessert/ >.